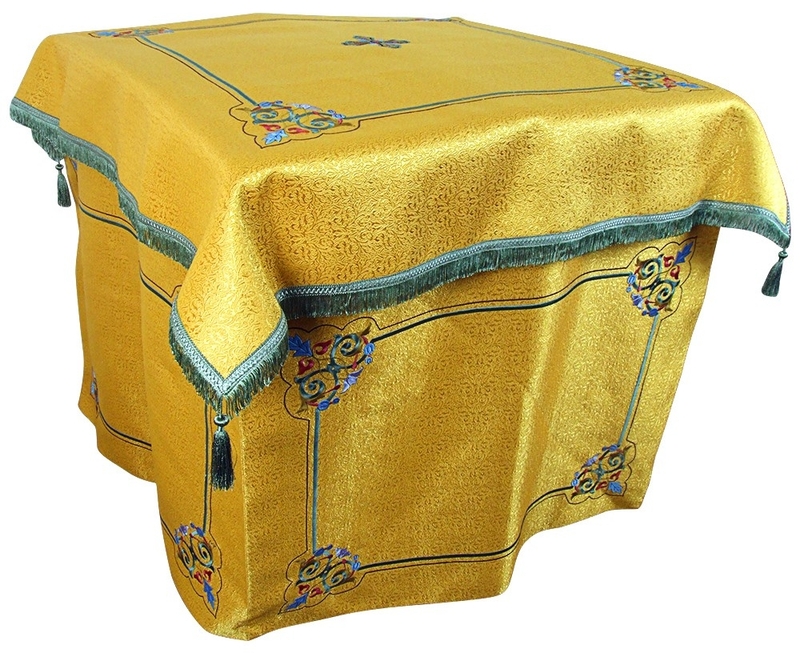 Orthodox Church liturgical Holy table vestments (yellow-gold) by Istok Church Supplies Corp.
Every Orthodox Christian church needs a resplendent yellow-gold Holy Table vestment that echoes the Glory of God’s Throne. 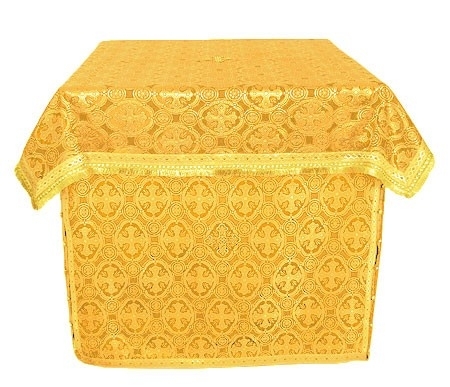 Istok Church Supplies is proud to offer a wonderful collection of yellow and gold Holy Table vestments that can be customized to your preference of size, fabric and decoration. The color of the Holy Table vestment changes according to the liturgical season. Yellow-gold Holy Table vestments are usually used on Sundays. Our yellow-gold Holy Table vestments are made from rich, ecclesiastical church fabrics such as silk, brocade and natural German velvet featuring beautiful hand embroidery. They are constructed with both aesthetics and sturdiness in mind, thereby guarantee a wholesome return on investment. We understand Orthodox Christian traditions with respect to church vestments. All the Holy Table vestments in this collection are in the traditional style, covering all four sides of the table and reaching all the way to the floor. They are put together by devout and experienced tailors who pay close attention to detail and quality workmanship at our workshop in Europe from where they are shipped. We are happy to help customers purchase a Holy Table vestment that fits their church requirement and budget. Customers have many flexible options to make the vestment bespoke. For example, customers can select a different fabric belonging to the same class as the one featured for a particular product. Customers can also upgrade their order with premium decorations and/or velvet inserts. Customers can further customize by providing us the measurements of their Holy Table and thereby purchase a one-of-a-kind, perfectly fitting Holy Table vestment. Trust us like hundreds of other customers across the world do - we deliver the best value by offering an unbeatable combination of high quality made-to-order church vestments, reasonable prices and a superior online shopping experience!